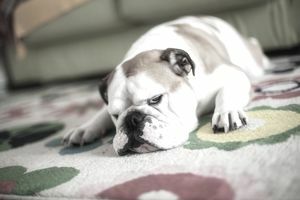 Have pet odors and other smells invaded your carpets and rugs? You don't have to buy a deodorizer at the pet store or the supermarket. You probably already have an effective, safe deodorizer in your kitchen cabinet (or absorbing the odors in your refrigerator). Here's how to deodorize your carpets the cheap and natural way. The easiest recipe is simply to use baking soda, as is, right from the box or canister. But for ease of use, you may want to put it into a shaker canister or make your own shaker. Make a shaker. You'll need a jar, a rubber band, and construction paper (glossy ads can work as well). Poke holes in the paper, Fill the jar with baking soda. Cover the jar with the paper and secure it with a rubber band. Now you can shake away, and you will get more even coverage of the area. Sprinkle baking soda over the carpet, and allow it to sit for at least 15 minutes. An hour or even overnight is better, so long as you can keep everybody off the carpet, including your pets. The baking soda won't hurt them, but you want it on the carpet, not on paws and shoes. Then, vacuum it up, and the smell will be gone! Baking soda neutralizes the odors in your carpet so that your house smells like your house and nothing else. It's inexpensive, and you may already have a box in the pantry. No harsh chemicals—baking soda is an alkali, but it is mild enough that we regularly consume it as an ingredient in baked goods. No fragrances to irritate allergies: this is a good reason to use baking soda rather than commercial deodorizers that have cheap artificial scents that may just mask the odors, plus give you a reaction that is even worse than the odor. Baking soda removes odors, rather than covering them up. If you are using baking soda on a wet carpet, be sure to test for colorfastness before applying it to the entire room. Keep children and pets out of the room while using it. Baking soda can irritate eyes if they get it on their hands and paws. You will also see suggestions from others to use essential oils, crushed flowers or spices along with the baking soda. These are suggested to add fragrance and repel insects and fleas. This could end up causing problems. They may stain your carpet and so you should only do this after trying it in a small patch to see the effects. The essential oils or spices should be used with caution if you have pets or people with allergies in your household as they could cause irritation.